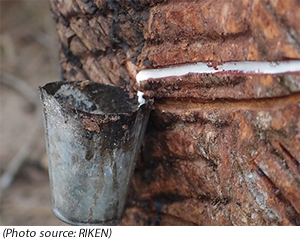 Researchers at the RIKEN Center for Sustainable Resource Science (CSRS) in Japan, together with collaborators at Universiti Sains Malaysia (USM) have successfully decoded the genome of Hevea brasiliensis, the natural rubber tree native to Brazil. The study, published in Scientific Reports, provides a draft genome sequence that covers more than 93% of expressed genes, and identifies regions specific to the biosynthesis of rubber. The team led by Minami Matsui at the RIKEN CSRS and Alexander Chong set out to sequence and analyze the H. brasiliensis genome, and find genetic information explaining why some strains of rubber tree yield more amounts of rubber than others. The team looked for genes related to rubber itself and for resisting disease two factors that affect rubber production. They found that the two most abundant proteins that make up rubber Rubber Elongation Factor and Small Rubber Particle are encoded on a large number of genes that are clustered together in a small region of the genome. While other tropical plants also express these proteins to some extent, being encoded more than eight times on different genes is unique to H. brasiliensis. The team also found that compared to other members of the Euphobiaceae family, the rubber tree has more genes related to disease resistance, and that these genes also formed clusters within the genome. Matsui thinks that the high latex production found in the rubber tree may be caused by a coordinated expression of these genes combined with increased gene number due to gene duplication. For more information, read the news release at the RIKEN website.